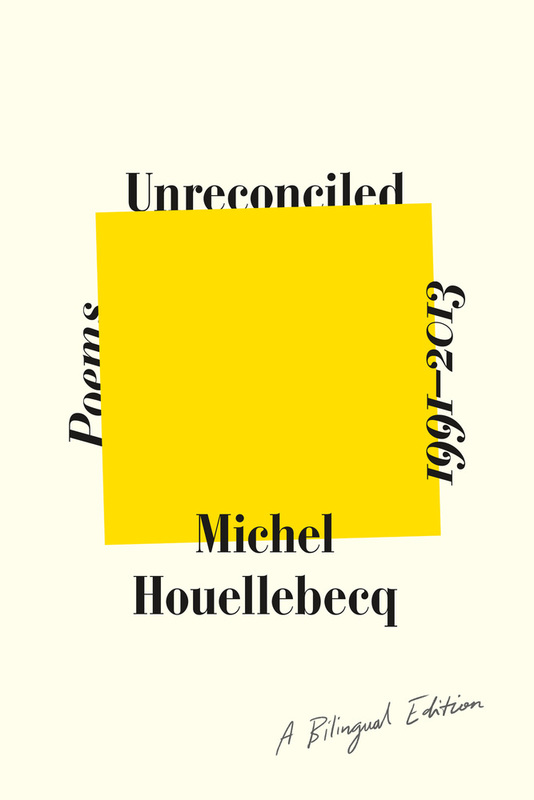 This miserable collection of poetry compiles selections from four books by French literary giant Michel Houellebecq, condensing over two decades of lyrical melancholy into a single bilingual edition. These poems wallow in alienation and stare down the inevitability of death, caught in a seemingly endless cycle of pessimism. Love, family, and a general sense of of philosophical artistry occasionally break through Houellebecq’s cloudy verse, only to be snuffed out by a particularly persistent sense of despair. Presenting Unreconciled as a bilingual edition displays the translator’s difficult decision to depart from the tightly rhyming structure that these poems boast in their original French. Readers who possess a basic understand of French will be able to see a dark sort of sparkle in the original verses: rhyming “indépendance” with “la souffrance” (suffering) is a twisted sort of brilliance, for instance, as is rhyming “cimitière” (cemetery) with “sexagénaires” (sixty-year-olds). However mopey and gloomy the words may be, Houellebecq clearly possesses an uncanny control of his native tongue, able to bend words towards a smirking sort of misery. The cypresses smell good and repel mosquitos. There’s hardly a way around this hurdle for a translator but the texts feel incomplete, and seeing the French in tandem, readers will know that they’re missing that sing-songy precision. It’s difficult to imagine any of these poems anthologized into a best-of compilation featuring multiple writers, as their strengths lie in their pace and proximity to other poems. 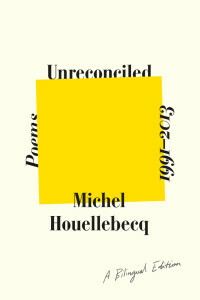 Houellebecq aims more for an overall vibe than he does for a perfect, knockout poem: a work like the three-line “Why can we / Never / Be loved?” does little on its own but retains some unique power by breaking away from Houellebecq’s persistent four-line rhyming stanzas, present throughout the majority of the book. To assess yesterday demands real courage, as I am afraid that by writing I will perhaps bring to light terrible things that would be better staying far away in my brain…. On the 18th: I crossed a new threshold of horror. I have only one urgent desire, which is to leave all these people. To live apart from others as much as possible. To call them highlights wouldn’t be appropriate, but it’s these moments of Unreconciled that cut through to a terrible, Dostoevskian state of torment. They refocus all the rhyming, tightly structured poems as a sort of emotional shield and reveal a writer hiding behind his language, the only defense he has.